If you think it would be strange to entitle the first movie about Dracula Nosferatu, you are completely right. Still, the 1922's German film about the famous vampire is called Nosferatu, eine Symphonie des Grauens (Nosferatu, a Symphony of Horror). As one might guess, it has been done for avoidance of legal issues. Yet, this early motion picture has not managed to escape from the plague of a legal finding that all of its copies should be destroyed. Fortunately, a few have survived and they've reached us in a variety of "enhanced" versions so this influential horror classic has not been completely lost despite the wish of Florence Stoker (the widow of Bram Stoker, the creator of Dracula novel). As one should expect from a 1922 movie, F.W. Murnau's Nosferatu is a silent film. And as it is obvious from some of the copies in circulation, attempts have been made for enhancement of the movie's sound with "special" effects and music but these do not seem to have been very successful efforts. Concerning the color, Nosferatu is a black and white film but blue, red and other tints are used throughout the movie in order to emphasize that a scene is happening at night, for example. The overall visual quality of the existing copies is not great but it is almost a century old film after all. There is a lot of stuff in Nosferatu worth mentioning. To start with, the Count's teeth are more similar to a rat's fangs than to the ones of bats or wolves eventually. On the other hand, Nosferatu's face resembles a bat and he has an enormous and menacing nose. Concerning the creatures around him, we see rats, not bats or wolves. It has been said that this movie is the first work presenting sunlight as vampire killer and most likely it is. The movie sports a notable scene with Nosferatu rising from a coffin that is later referenced in plenty of materials. There are lots of special effects, mainly related to better portraying the Count unnatural appearances but also to make some scenes more fearful and mystic. Shadows are under heavy use and they appear to be a great instrument for frightening. There are scenes in Nosferatu that are not connected to the movie in any way (except probably symbolically) and also some events that are not well or at all explained. A couple of times, a biology professor is shown teaching his students about vampire-like species or he is just incidentally referred in another episode without any significance to the plot. Knock, Hutter's boss, apparently has some strange connection with the Count but there is not even a hint about its origin. Some people say Nosferatu is their favorite movie, or that Nosferatu is the greatest villain in cinema history, or that there is not other so disturbing film. Honestly, it is difficult to believe all of these. Max Schrek is really wonderful in his performance of the Count but it is hard to say that he is scary in today's terms of horror. 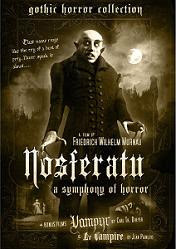 In fact, Nosferatu is even funny to an extent when seen through contemporary eyes. The film is also neither so disturbing, nor frightening. Not to mention that Dracula's story is so famous, it hardly could be a scary one nowadays. But although the movie is not really so impressive today (and to claim the opposite would be a direct lie), it has been a rather influential effort at the time and most probably people have been genuinely afraid of Nosferatu. It has pioneered a lot of film making techniques and special effects as well as introducing some innovative ideas. And if this is not enough, just see how many subsequent Dracula movies have been released since then. If you are interested in the development of cinema or you are just curious how old classic movies have looked like, find a copy of Friedrich Wilhelm Murnau's Nosferatu, ignore its picture quality and enjoy the rest through the eyes of a person living in the beginning of the former century. Find more movie reviews in our Review Maze.